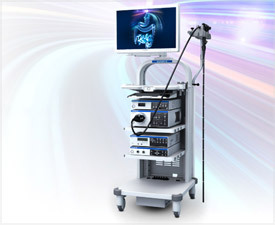 Throughout the history of our company, Olympus has been renowned as a pioneer in developing innovative technologies that enable physicians and surgeons to peer inside the human body, fight cancers with minimally invasive procedures, and diagnose and treat a broad range of illnesses across a broad spectrum of specialties. Our technologies can help clinicians see more and do more; they can help minimize patient discomfort and speed recovery; and they can optimize workflow and maximize operational efficiency, both inside and outside the procedure room or surgical suite. NBI delivers enhanced observation of mucosal tissue and can be used to target biopsies in patients with Barrett’s esophagus. The THUNDERBEAT Universal Platform is a full featured energy system that delivers virtually every known form of surgical energy: Monopolar, Bipolar, Advanced Bipolar, and Ultrasonic. RIT is a combination of three Olympus technologies working together to ease insertion and improve operator control. The Rotary Function advances maneuverability with outstanding handling and unmatched tracheobronchial access. PlasmaButton™ vaporization is a completely new surgical option that is now available to doctors for the treatment of benign prostatic hyperplasia. PK® Technology allows the surgeon, rather than the device or system, to choose how long energy is applied. New two-stage optical lens technology allows physicians to switch from normal focus mode to near focus mode with a single button. When capturing a still image, this function automatically selects the sharpest image of the desired view. This feature delivers real-time visualization of the scope’s position inside the body for improved procedural efficiency and patient comfort. Olympus offers robust software and integration solutions that connect all aspects of your healthcare facility’s operation for maximum efficiency. Olympus’ surgical subsidiary manufactures innovative technologies in several focus areas, including urology, gynecology, ENT, and surgical energy.